David Smart: “Apart from that red there these are the colours of Refreshers”. 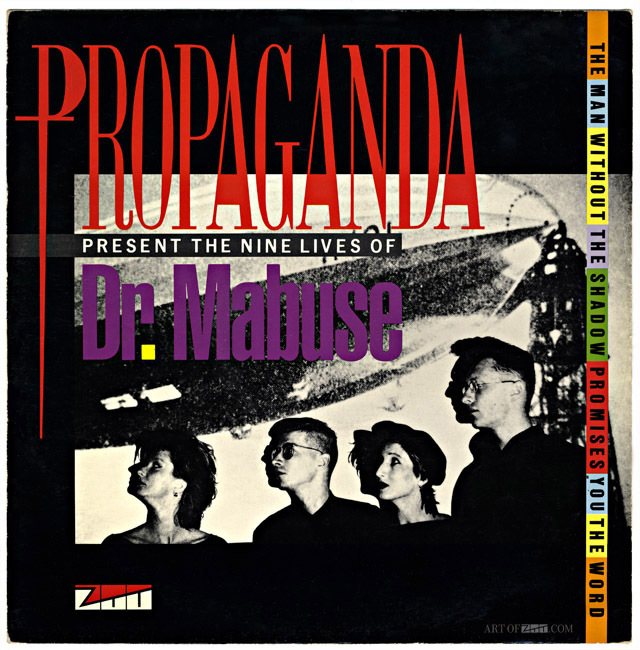 artist: Propaganda title: Dr Mabuse format: 7″ / 12″ single design: XLZTT photography: Anton Corbijn illustration: Anton Corbijn cat. no: ZTAS 2 / 12ZTAS 2 date: ?/03/84 art of notes: This ‘zeppelin’ sleeve was the second of two different designs for both the 7″ and 12″ (the other is known as the ‘hand’ sleeve). It’s generally thought that these alternate sleeves were created for instrumental versions of the A side but this was never highlighted on the covers and either vocal or instrumental versions of 7″ or 12″ could appear inside either designs. 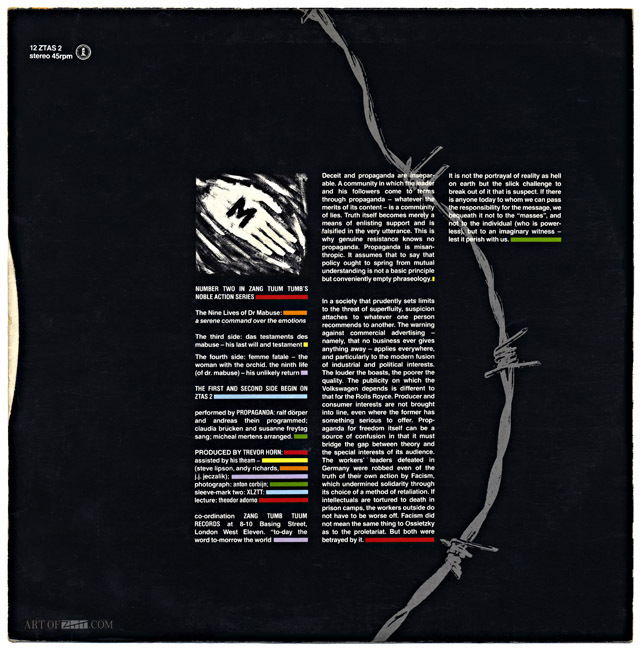 The front covers of the 7″ and 12″ are virtually identical with only some slight size adjustments but the back covers were noticeably different, the on body labels for the discs are identical to those pressed with the ‘hand’ sleeve, possibly leading to the randomness of which disc you got once they were sleeved. 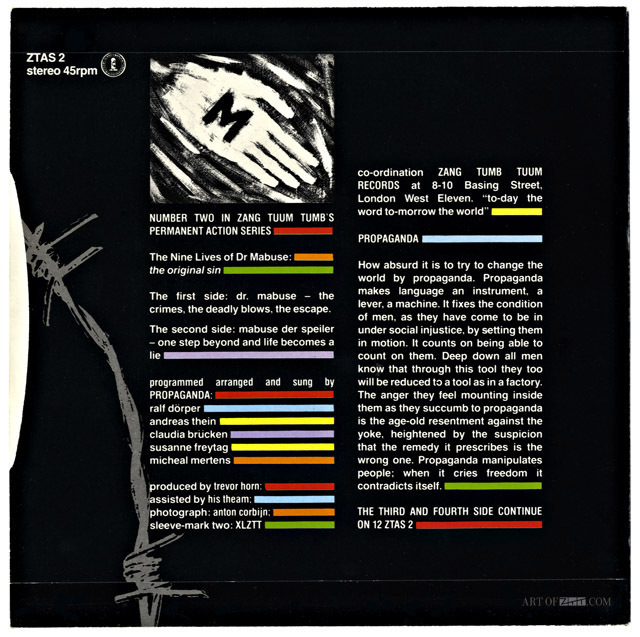 It’s not known exactly when the ‘zeppelin’ sleeves with the instrumental versions were released but the cassette version of ‘Dr Mabuse’ appeared somewhere between March and April ’84 and had a similar cover design so this is a good estimate.